After watching the movie Fat, Sick and Nearly Dead we have decided at the Hoefer-Gainford household to do a juice cleanse. Like the ones here. This idea involves buying lots and lots of fruits and vegetables (and I do mean lots) and running them through a juicer and drinking the juice. And some water. And nothing else. This will cure all manner of ills and blah blah blah, cure everything. On day 8 now (day 11 for Ursula) and it’s a terrible idea. One of us will kill the other one. And quite possibly eat the body. If you walk by me with a burger I may stab you. I’m jealous of the cats when I open a can of cat food in the morning. Those smug bastards getting to actually eat food. It’s been recommended we go for 21 days. That may be only 18 for me but it’s still another 10 days. If you find my body (or quite possibly not my body, just a few bones with teeth marks) you know where to look. If Urs goes missing, in my defense, I am pretty darn hungry. I like to cook, but recently (last few years) I’ve cooked less and less and am now down to repeating the same 2 or 3 recipies over and over. So this year, as we have 30 or 40 cook books, I thought I should try and make something new each week from them. Maybe I’ll end up expanding my rota of recipies to 4 or 5. Bear in mind these are all gluten free vegetarian with no mushrooms. Made for me who likes meat and wheat. The mushrooms are still off the menu as they are the food of satan. So I made vegan enchiladas yesterday. Just not actually vegan as I added cheese. They were from a vegan cookbook, The Oh She Glows Cookbook but I’m also not giving up on cheese. They were tasty. Like really tasty. The avocado – cilantro dressing worked a treat. Even though I was missing half the spices (onion powder?) these worked well. Which comes to this morning. So happy I have left overs ready for lunch for work. Feeling all proud of myself that I have a delicious, healthy lunch just ready for the microwave. All smug about it until I arrive at work and go to put it in the fridge and find last weeks curry in my bag. With no rice, just about half a cup of too old curry in a large container. I really need to clean out the fridge more. Herself won the Calor Housewife of the Year award with this advent calendar. 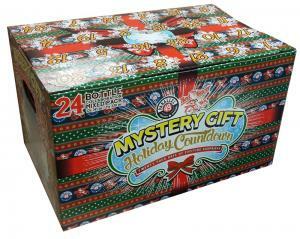 What better way to celebrate the season than by sampling a different craft beer each day? I sampled some, Yoda sampled some and they went down very well. There was one tiny problem, we’re flying to Mexico for Christmas and I’m not trying to bring beer with me so I had to finish up on the 21st. So I had 5 beers to drink over the weekend. That went fine, Saturday I had two of them, two very tasty beers. Yesterday though after my Christmas drink of choice (Baileys coffee) I had three of them. And they leave the strong ones to the end. The 9.5%, the 11% and who knows what the last one was. A little tender this morning. Crafty brewers, they sneak up on you. In one of the many online contests I won a DVD of the new Godzilla movie from The Province. Just one small catch, I have to pick it up from the newspaper office. Downtown. 40km from my house. During the hours of 9 – 5, Monday to Friday. So, should I take a few hours of work, travel down there or just buy it on Amazon? Decisions, decisions, decisions. I have a feeling the offices of the Province are littered with uncollected prizes. 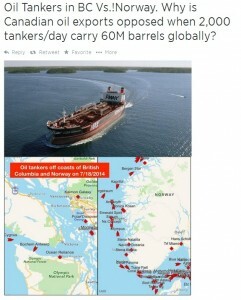 There are a few twitter accounts pushing tankers and piplines and today they’re going all out with the information. I’m all for progress, but if it’s so safe and economically sound, why are they fudging the figures? Like this one. On the left is the tweet showing the many many more tankers in Norway than in BC. 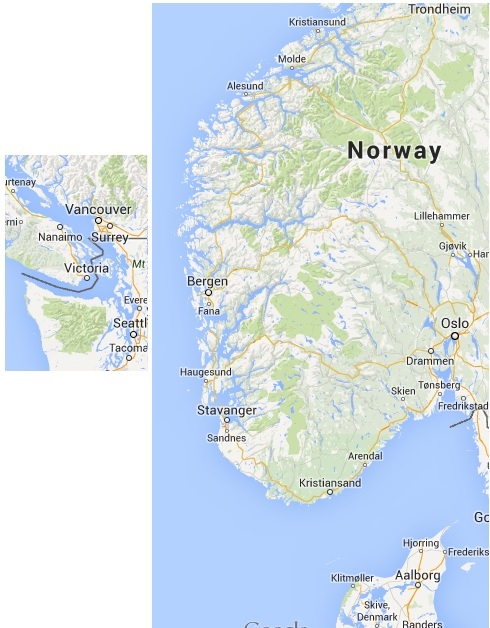 25 seconds on Google Maps and I’ve got the 2 maps to the same scale on the right. 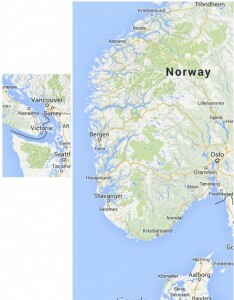 Also, Norway is a lot of open ocean, BC is a lot of narrow passages. If this is so safe, why are they fudging the maps to make it look like this? It reminds me of these maps. Image from David Suzuki’s website, click on it to see the article. That’s a great point, why aren’t we selling to Japan? 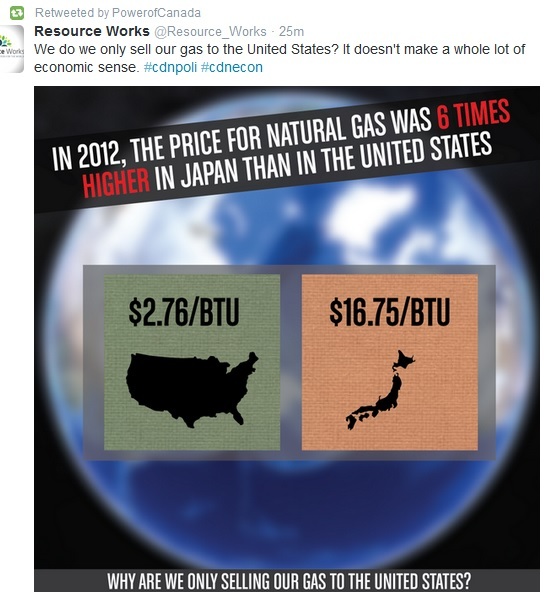 Wait a minute, 2012, did Japan have any reason to increase the amount of natural gas they use? Something about a recent earthquake shutting down 11 nuclear reactors? Now Japan only pays about 3 times the US. Which could be due to the fact the US has natural gas and Japan doesn’t. Then there’s the cost of moving the gas. I’m guessing getting it across the 49th parallel is easier than the Pacific. So with all these tweets how about using real numbers and comparing like with like. Use maps that are to scale and don’t have mysterious disappearing islands. This isn’t Lost you know. And use current figures and projected figures for the future, not a historical jump that was due to a massive earthquake. If for no other reason than this, I would oppose the pipeline and the tankers. If you have to lie about it then there’s probably a whole lot more going on that you can’t fudge the numbers for and are keeping quiet. So tomorrow is Friday 13th. And a full moon. And I’m taking trainees sailing for the weekend. With small craft warnings for the up to 25 knot winds. We’re taking a small craft. The weather’s getting better so it’s time to put the bike back on the road. Oh motorbike, how I’ve missed you. It turns out that I can do this. Given a car that breaks down and they key won’t turn because the ignition switch is busted I can hotwire it. With a lot of tools, swearing and about two hours. Life of crime here I come. This morning I came in from a run and made myself a coffee. OK, more truthfully I came in from a walk / slow jog and made myself a coffee. And spat it out. Thinking that maybe there was some residue in the mug from the dishwasher I got another mug, checked it was clean and made more coffee. And spat it out. Mug number 3 I used sugar straight from the bag instead of the bowl. Success. Strange though, I didn’t think sugar went off? Anyone hear of this happening before? Other than magically transforming into alcohol (which is welcome in my coffee) sugar stays as sugar. Sat down at my computer and the keyboard was unplugged. I plugged it back in, thinking nothing of it. I unplug stuff all the time for memory sticks, chargers and whatever. Also as it has a view of outside, both the cats find my desk and laptop to be excellent sleeping spots so maybe they unplugged it. Hey, go easy here, I’m still starting my 1st 2nd 3rd or whatever mug of coffee of the day. I move my mouse and not a whole lot happens. Fine, this one can need to be turned off and on again as the battery probably needs to be changed. Turned it over and found tape on the bottom covering the laser. It’s April first. Good ones Hoefer. If you know of anyone looking for a short term (1 year or less) person, please let me know. There are a lot of projects at the moment upgrading from Windows XP to Windows 7 or 8.1, or bringing servers up to 2012 and virtualizing them and this is what I’ve been doing quite a lot of in the last few years. You can see my contact details on the Contact page of this blog.